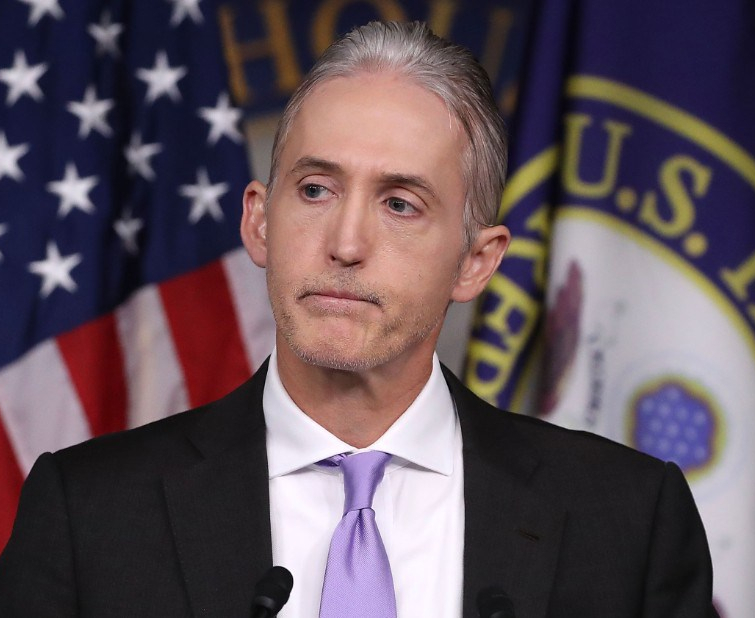 On 28 June of this year, Trey Gowdy, the Republican congressman from South Carolina, demanded that the DOJ complete its investigation into the Trump-Russia conspiracy. “Finish it the hell up,” yelled Gowdy, aiming his vitriol at Deputy Attorney General Rod Rosenstein while demanding to see evidence. Right about now, Trey Gowdy may be regretting that outburst. The Mueller investigation is far from over. But with the Friday the 13th indictment, Mueller and Rosenstein delivered Gowdy’s cuspidate head on a platter. Gowdy is the guy who mounted a two-year campaign to persecute Hillary Clinton and damage her presidential candidacy, wasting nearly $8 million in taxpayer dollars, amassing millions of documents, interviewing and haranguing Cabinet officers and low level operatives, leaking with abandon, pontificating with that gruesome sneer. He is the same who worked up a greasy sweat interrogating the former secretary of state for 11 hours; whose fascination for a private email server and its “missing email” gave fodder to Trump, his ignorant cult and Russian conspirators. He is the fellow who concluded the abusive and ultimately baseless inquiry with not a scintilla of guilt to adhere to Clinton. The Special Counsel did not randomly include the detail of this theft any more than his explicit mention of the July 27, 2016 first attempt to break into the personal email server of Hillary Clinton – literally hours after then-candidate Trump called for the Russians to find her “missing email” (p. 7). No, there is an explicit line connecting Gowdy, the farce known as Benghazi with its “missing email” and Trump and his request for those same “missing email”. Trey Gowdy demanded evidence and Mueller delivered. Reasonable people must ask why Russian military intelligence (GRU) would seek out documents on Gowdy’s Benghazi hearing? And while the Benghazi committee was still active? And why steal from a hacked machine supporting Democratic House members? Did the contents of that stolen folder make its way into Gowdy’s computer? There are many, many questions wrapped up in this revelation. When we ask who would specifically benefit from such information, there is one logical answer: Trey Gowdy. This is the so-called legal wizard re-elected to Congress in 2016 at the behest of fewer than 200,000 South Carolinians. This is the same representative whose public questioning of FBI Director Wray, Deputy Attorney General Rosenstein and FBI agent Peter Strzok bore more resemblance to interrogations of the enemy than impartial judicial inquiries. As a former prosecutor, Trey Gowdy should have known better. Never ask a question (show me the evidence) without knowing its answer. But perhaps Gowdy DID know. Perhaps he knew that Mueller and his team were circling ever closer. Perhaps he felt the heat and understood the consequences. There is a reason Mueller composed an indictment implicating Russian cyber spies with the Benghazi hearings. Nothing is happenstance. Call it a dog whistle, an alert or omen, a sign of things to come. Trey Gowdy is inextricably and permanently locked within the confines of a federal indictment. His name is forever blackened by that association. Benghazi – Gowdy – the GRU: it is all one now. Be careful what you ask for, Trey Gowdy. Quoting Ecclesiastes, Gowdy told his faithful he would not seek re-election. After this term, the small prosecutor who badgered giants will leave politics. He intends a return to the practice of law. Time will tell. Mueller will tell. A last question: did Trey Gowdy read all of The Preacher? Did he note this bit of wisdom? Will he be one of the 10 to 15 Republicans that Mueller is looking at ? Not sure about that. It is easy to hate Gowdy (Benghazi waste) but he has one saving grace. He shot down the Nunes memo – I would say that he sabotaged the memo. Makes me think he has some gnawing sense of patriotism left.